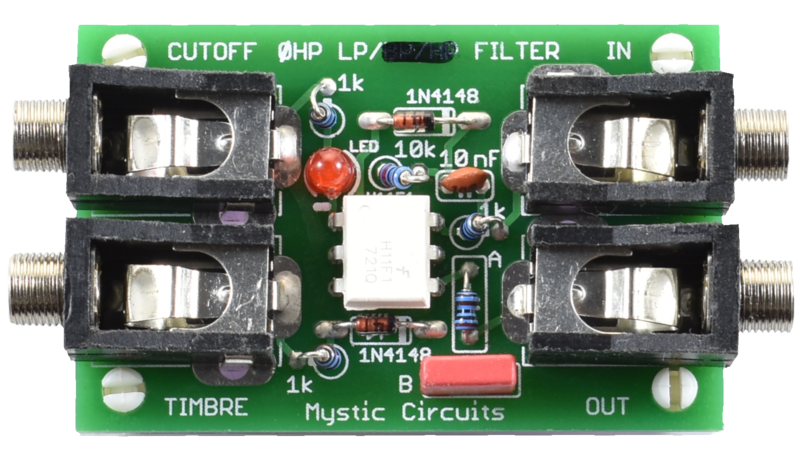 An audio filter in a tiny package! A blend between our "AND - gate" and our "Vactrol Low Pass Gate" circuits, the cutoff frequency can be modulated at audio rate. It also features a voltage controlled clipping circuit which allows for further wave shaping. The response of this circuit is much faster than that of the Vactrol Low Pass Gate, so it will react to very plucky envelopes and even triggers. Whether you need some extra utilities for your studio behemoth or you need to save space on the road, 0HP gives you options. Our modules come as a small circuit board mounted to a colorful piece of laser cut plexiglass, with a small chance to get one of our fabulous rare colors. With a robust line of modules planned in the future, full DIY kits and an open hardware licence we aim to make modular synthesis accessible and fun for the veteran and new user alike. Since the modules are passive, some signal loss and distortion should be expected. The user is expected to keep cables away from the top of the circuit board. While in 99.9% of cases an accidental short circuit is not an issue, Mystic Circuits, Eli Pechman or any of our retailers assume NO RESPONSIBILITY for modules that are accidentally damaged by doing so. This expectation follows same logic as not plugging an output into another output or touching your cables to the panels, which are common safety practices expected to be followed by the end user.